Dont use the hashtag #CounterJihad !! Ok, why not? Well I used it once, thinking it was original and to refer to responses to Islamic terror attacks in the UK. Anyway, why mention it now? Well my investigatuion led onto a group called 'The Identitarians'. Who some consider part of the White Supremicist Counter Jihad movement (admittedly this is by Hope Not Hate who are complete nutters, funded by Soros and run by a lunatic - and behind physical attacks on Nigel Farage and organisers for Black Block the masked loons who riot under the cover of 'counter protest' whenever non-Marxists gather for any kind of event). Now the Identitarians are newsworthy right now because the Daily Mail's Katie Hopkins and former Rebel Media star (and male attack helicopter) Lauren Southern have been covering their latest exploit. And that exploit is.. a crowd funded African refugee rescue ship in the Mediterranean. The Identitarians pitch is as a group interested in maintaining the traditional cultures and diversity of the European nations, and as such they are not happy about mass migration from Africa. They are particularly unhappy about the existing NGO 'rescue' boats picking up boat loads of Africans just off the African coast and them ferrying them all the way from Africa to continental Europe! The Identitarians declared plan is to offer their own rescue service, picking up ('rescuing') boat loads of Africans just off the African coast and then quickly returning them to the nearest African port. Saving many hours of travel time, so being available for far more rescues and avoiding the mass migration issues that have been plaguing the EU for a very long time now. The rented ship 'C Star' is getting close to its rescue holding position now, you can track it here! Are they good guys? Who can know? But it is unfortunate neither Katie nor Lauren ended up going on board. The EU elite and its supporters want to destroy us - know your enemy. The really important thing to note from this is that has nothing to do with 'The Jews' - while the Count was married to a jewish woman, he was not a jew. He was a semitophile who created this mad plan and convinced Europe's own, native 'elite' to put it into practice. It is our own progressives who support the EU and this mad plan to destroy us who are our enemies. I didn't know Trotsky was Jewish. It isn't something that would have mattered to me. Not until I read that a certain notable politician describe jews as a 'master race' who would rule over a continental Europe which had had it's traditional nations and peoples eradicated and replaced by a 'Eurasian-Negroid race of the future, outwardly similar to the ancient Egyptian, [who] will replace the diversity of peoples with a variety of personalities.'. To support his claim of jews as a master race for Europe he wrote 'Modern Judaism exceeds all other nations in its percentage of great men: scarcely one century after its liberation this small people stands today with Einstein at the forefront of modern science; with Mahler at the forefront of modern music; with Bergson at the forefront of modern philosophy; with Trotsky at the top of modern politics.'. "In 1922, when this Tokyo-born young aristocrat living in Vienna started to campaign for the European idea, it was just that: an idea. Hapless, it seemed, and utopian. But in the uncertainty of the times, right after the worst war in the history of mankind, the idea struck a chord." This was said by none other than the President of the European Council (at the time) Herman Van Rompuy in his Acceptance speech at the occasion of the Award of the European Prize Coudenhove-Kalergi 2012 “Peace and the European ideal" - the EU's highest award, in the name of Count Coudenhove-Kalergi. A man who openly called for European people to be reduced to a grey goo of Eurasian-Negroids ruled over by a jewish 'master race'. One twist to this disgusting plan (conspiracy?) is that the British were never expected to be part of it! The Count saw the British, the English, as too good to be part of his plan - he didn't anticipate the corruption of the UK by our degenerate progressives who welcome being part of his 'mogrelism'. "The precursor of the planetary man of the future is the Russian Slavic-Tatar-Finnish mongrel of modern Europe; because he, among all the peoples of Europe, is the race of the typical multisoul people with a wide ranging, encompassing soul. His strongest antipode is the insular Briton, the highly bred single minded man whose strength typically lies in the character, in the will - he provides modern Europe with the most closed, perfect type: the Gentleman." The authorities, by telling these lies, are themselves likely to be stirring up racial hatred - a crime... What do you think the chance of any prosecutions against the police or press are? Nill? Yes I think so too. A bloke has a grudge against your church, he publishes messages on facebook genuinely calling for people to join him in killing members of your church and burning down their properties. A bloke runs a burger van, he takes an order for food from a passing member of the public then insists on discussing divisive political issues, the innocent customer is taken by surprise, but disagrees with the burger man who argues, is rude, refuses to serve the food they have ordered and implies they should leave the area quickly. Most people would agree that neither of these scenarios is acceptable. The first is very serious the second is less so, but rather thuggish. Well something similar to both of these scenarios did actually happen. The first resulted in a jail sentence, the second in a fine. The issue behind both of these situations in reality was Islam/Muslims. And in both cases the information given to the public by the police/press has been deliberately misrepresented by them to cause the public to think that it was the individuals thoughts/words that were illegal, not their intentions/actions. These two events would be crimes regardless of who the 'targets' were, but as it was a protected minority they are both called 'hate crime' and this is the headline that is presented. In the first case the police issued a crowing advert saying the pepetrator was jailed 'for expressing his islamophobic hate online' - clearly a lie, as it was the call to violence that got him jailed, not the specific target of his call to violence. In the second the headline was 'Burgerman convicted for hateful racist rant', again misleading as it was the threat/intimidation to the customer that got him in to trouble, not the subject of the rant. The police and media are lying to the public. Their purpose is make people think that the UK has laws that make certain thought and words illegal - so certain views can be silenced even though, in fact, the UK has no such laws. When these lies are believed one reaction is for the public to comply, and so self censor the free speech they are entitled to as British citizens. A second reaction is to create public resentment towards the authorities and/or the 'protected groups' believing that they are respnsible for taking away a right that many believe is one of the most British if values (free speech) - while it is a complete lie that the right had been taken away. But both the CPS and Met have accepted that they are misleading by back-peddling slightly on one occasion each, the Met admitting that opinion is not abuse. and the CPS acknowledging that 'hate crime' is not an actual thing. A normal, white, christian, A level student can be radicalised at home to be a Jihadi in less than a week? Old Testament/Jewish Circumcision - Male Genital Mutilation. I don't care about 'races', as far as I am concerned there is only the human race. However I do care about 'cultures' inherited sets of rules that may arbitrarily define a behaviour for no reason other than historic. Whether the culture is followed citing history, deity or anything else is irrelevant, we may choose to follow traditions, but cannot be bound by ancient phantoms. I am a libertarian, I want the best for myself and would like that to be available to everyone. Life can involve irreversible choices, so if at all possible they should only be made by the person they impact. Irreversible non-medical surgery on infants offends me because I would not want it done to me if it could be avoided. If today in the UK there was a culture that called for the destruction of children's feet I would unreservedly condemn this aspect of it - that this used to be required in the Chinese Imperial Court centuries ago, and has some traditional following to this day would carry no weight with me in the modern UK. Now onto the meat (no sniggering). The Old Testament clearly does call on Abraham and his male descendants (natural or purchased(!)) 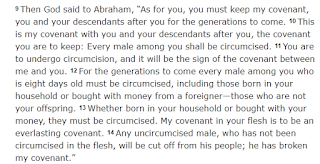 to be circumcised or rejected by the community (I guess this implies Christians too - unless the new testament says something about it - I doubt googling this would get the kind of results wanted!). Now if this can't be reconciled with modern UK culture it must simply be banned - soz, this is my starting point, the status quo is not acceptable, we recognise this for girls (even if our disgraceful police forces refuse to act on the law they are sworn and employed to enforce). Well, we already reject the purchasing of children that this old testament bible passage seems to allow, so there clearly is flexibility. Also it calls on eight day old boys to be circumcised but does not say who by, and suggest no penalty against anyone for not doing so. So there is no penalty for anyone refusing to perform a circumcision, the only sanction is against an individual who should be 'cut off from his people' if uncircumcised. It is inconceivable that a child should be punished if they are not in a position to make a decision - so the lack of circumcision can surely not mean that a child should be punished or cut off from his people? (We've already ruled out selling them off!). So if a child is not circumcised there is no punishment or sanction to be imposed on anyone. However, this would change when the boy comes of age and is then competent to make a decision - in this case, they have the choice as to whether to follow this passage or not. They can freely choose whether to be cut off from their people, or from their foreskin. Just to reiterate, in any case mutilating infants should not be allowed in the UK. I believe there is an acceptable solution in keeping with the old testament, but if that isn't acceptable... tough. The Three parts of Free Speech. No one cares about 3, it is meaningless platitudes and drive. Many people have qualms about 1 'Shouting fire in a crowded theatre' etc. But 2 is where the real risk to our liberty lies -- those who seek to silence us attack legal free speech, they seek to convince us that it is actually illegal, or that it is so close to illegal it is not safe for us to speak at all. They suspend, investigate and maybe even prosecute - knowing there will be no conviction, no law has been broken, but also knowing that many others will now be worried about similar baseless accusations and will so just keep quiet - their free speech will be chilled. This is why I am looking to get people together and maybe a fund to help protect those who are in group 2, but are being persecuted anyway, people like myself! Public sector workers (esp teachers etc) who have their valid, legal views silenced from fear of persecution. If enough of we individual citizens stand up to this then we can beat the bastards! For the avoidance of doubt there is nothing embarrassing on any of my computers. Even if for no other reason than I use them for work and anything may pop up, also I already assume the police track everyone on the internet anyway! The police arrested me at home for the sole purpose of performing a search to enable them to seize my phone/computer without getting a search warrant (which I have no doubt would have been declined). Their arrival was the first confirmation that they were investigating me - I had phoned them twice over the previous two days asking if there was an investigation (the local press seemed very well informed) and if there was an investigation what I could do to ensure it was completed as quickly as possible (to protect my reputation and business). I would have attended a police station at the drop of a hat to get this matter sorted out. The arrest was on suspicion of publishing some material on twitter - material they already had full access to - and still do! There has been no request to take the tweets down either to myself or to twitter. I confirmed that I had written the tweets and explained why I had written them. Clearly the material was not enough for them to make the bogus charge stick so they wanted to seize my computer equipment in the hope of obtaining something new to prosecute me for - 100% a fishing trip. Once they find nothing, I am sure they will keep looking to save face. Unfortunately Sussex Police have a 17 week backlog of mobile phones for processing - so that is the shortest amount of time it will take. But under this new 'Released Under Investigation' brain-dead UK law (thanks idiot Theresa May!) there is no maximum time limit -- at least bail has a 28 day limit on arrest to charge/no-charge! So they can string this out forever, keeping hold of hundreds of pounds worth of computer equipment (seized without reason, in contravention of their own published policy, and entirely outside their own published process for doing so), equipment that I will soon have to replace at great and unnecessary expense - unless I can get the whole thing thrown out for their abuse of process. I have started a Free Speech Protection Fund email list - do sign up! It is on mailchimp so you have full control of your details/subscription - the Police and local councils must not be allowed too chill the legal, free speech of the British population. For the avoidance of doubt there is nothing embarrassing on any of my computers. If for no other reason than I use them for work and anything may pop up, also I already assume the police track everyone on the internet anyway!